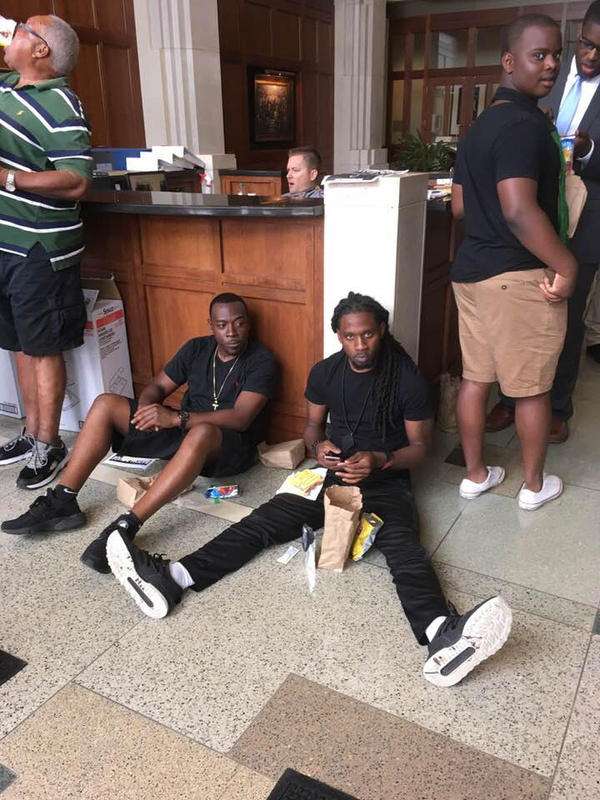 UPDATE: Talk 107.3 FM radio posted this picture to their Facebook of today’s protest, which apparently is going to be a daily event until a grand jury is empaneled to indict Blaine Salamoni in the Alton Sterling shooting. ORIGINAL: We all know the reason, of course – some people simply haven’t squeezed Sterling’s corpse out of quite enough relevance just yet, even though two years on this “outrage” has decomposed beyond easy recognition. 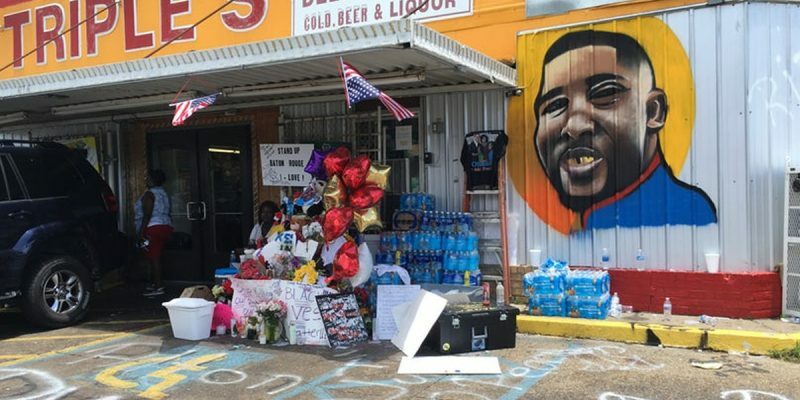 The Baton Rouge NAACP is rallying for the Alton Sterling case to be given to a grand jury. The rally is set for Monday at noon at the Louisiana Attorney General’s Office. Last week Jeff Landry announced his findings in the case. Landry’s office came to the decision not to charge Baton Rouge Police Officers Blane Salamoni and Howie Lake with Sterling’s death. In his remarks, Landry added that there was insufficient evidence to take the case to a grand jury, a point that frustrated many local leaders. During WBRZ’s coverage, last week legal expert and former Baton Rouge prosecutor Prem Burns said she was surprised a grand jury wasn’t allowed to make the call. News of the NAACP wanting a grand jury to look at the case comes just days after Police Chief Murphy Paul fired Salamoni and suspended Lake. Really, this thing should have been concluded on Friday, when Paul made the announcement that Salamoni was being cashiered over the Sterling incident. His firing was arguable, but at least justifiable – the video of the incident shows him engaging in tactics which would have been defensible if they’d worked – and in fact they did seem to work, as when Salamoni pointed his gun at Sterling and threatened to kill him if he didn’t comply with police instructions, Sterling did, for a while. The problem is that only a couple of minutes later Salamoni did end up killing Sterling, and that’s a bad look. Not bad enough for charges to be filed against him, but certainly enough to make Salamoni a sacrificial lamb for the department. There are people angry about Salamoni’s firing, but on the whole there seems to be a consensus in Baton Rouge that it’s a result we can all move on from. Except the NAACP can’t move on from it, because what will they complain about in Baton Rouge if the Sterling business is finally put to bed? How will they be relevant without him? At least until the next police shooting – but since Paul is an African-American leading the BRPD, the screams of systemic racism and police oppression will largely fall on deaf ears. So no, it must be Sterling. And per Saul Alinsky’s Rule 13, the target must be frozen, personalized and polarized, and that’s why it’s now Jeff Landry’s fault that a grand jury wasn’t called in the case. Forget about the fact that independent experts said the shooting of Sterling was justified, and forget about the fact the U.S. Department of Justice – the Obama Justice Department at that – couldn’t drag the case into a grand jury room. Somehow this is going to turn out to be Landry’s bad faith. Never mind that the NAACP didn’t demand a grand jury get the Sterling case when it last chose to rabble-rouse on the issue. In that press event the demand was for the firings of the police officers, a demand which was fulfilled in Salamoni’s case (nobody has explained what Howie Lake did to even be suspended; the evidence shows Lake followed police procedure throughout the incident). Now, as the case is being closed with the public the NAACP is elevating its demands. That’s what you can do when you have no credibility in the first place. Which the NAACP doesn’t. We expect a meager crowd to turn out at their protest at noon today. Previous Article Are You Ready For Ann Coulter’s Appearance In Metairie Next Week?